Hi loves! How are you today? It is very very hot here (at least outdoors), around 31 degrees Celsius. It has been around 20 degrees Celsius for days so it makes quite the impact. Tomorrow it'll be even hotter and in the evening thunder is coming, together with rain... so far our summer weather LOL! Today I am showing you a combo I quite liked. It's Bondi Blue Skies and Essie Stroke of Brilliance. I bought that last one not only because it is such a pretty glitter, but also so I can try and recreate a look like this. I love that one so much! 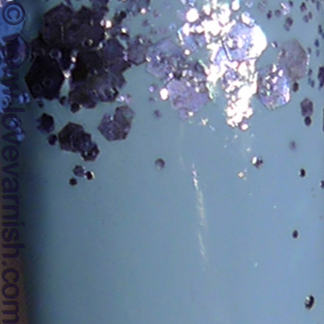 Bondi Blue Skies is a lovely creme polish, kinda dusty and not quite pastel, but not bright either. Somehow it makes me think of freshly washed sheets, whispering in the air.. Uhm, yeah. It might be the heat talking ;-). It applied easily in 2 coats. At first it was kinda goopy - not completely selfleveling while being very opaque. But, I did shake it quite well before using it and after it settled a bit, my other nails painted much easier somehow. After it dried I used a sponge and Essie Stroke of Brilliance to create glitter tips. I am not completely happy with how these came out, but oh well.. you win some, you loose some right? The endresult was still quite nice! Bondi polishes can be found on their own website as well at Harlow & Co. They retail for $12,50. Also check out their Facebook, Twitter & Instagram! Bondi is a very customer friendly company - it makes the polishes even better for me. Do you own Essie Stroke of Brilliance? And what is your favorite combo with it? Gorgeous combo, love the glitter tips! Love this combo. So pretty! I think they're awesome! I don't think I use glitters like these enough. It is! Such a stunning glitter. Yeah it is quite the contrast haha, going from Spring like weather to 30 degrees. I wish it would have stayed around 25 and lasts all Summer! Thanks dear :). No you don't, you need this one ;-).